So began H.R.H. Crown Princess Mary her speech at Odense Flower Festival 2017 a few days ago. In only 10 months and 10 days from now on 29th June 2018, our lovely Crown Princess Mary will baptize the 18. World Rose Convention rose at Rosenborg Castle. Edible GOURMET ROSES made by rose breeder Rosa Eskelund was introduced at Odense Flower Festival 17th – 20th August in the City of Odense on the island of Funen, also the birthplace of our famous fairy tale writer Hans Christian Andersen. 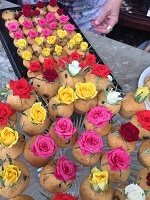 I had the pleasure of placing the roses on the mini – muffins, while people patiently waited to taste a cake with an edible rose. The tasting was announced to be Friday from 2pm to 5pm. By 4pm all 500 mini-muffins with an edible rose were gone. It was fun to answer all the questions and hear the comments to an edible Gourmet Rose. Rosa has so much success. She is a gem for rose lovers and the interest of roses in general. 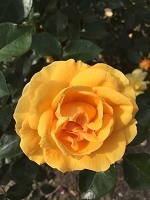 The 50 year Golden Jubilee Rose look pretty and healthy in the field (photo taken a few days ago), in spite of a very wet August making most roses look miserable. A preliminary program, registration, tours, negotiated hotel rate is available. Simply log on to: www.wrc2018.dk.